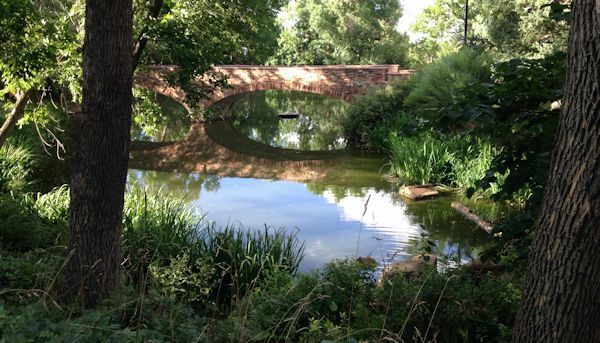 Some years back when I was editing the local Trout Unlimited newsletter, I got a letter from a CU alumnus in Denver who had recently visited the campus and had taken a stroll across the bridge spanning Varsity Lake. He wrote to me of his outrage over what he thought was nothing but a fetid, foul looking, stagnant slough of a pond. Why, he pleaded, could not we of Trout Unlimited force the university either to clean it up or fill it in. He was ashamed of the campus and shocked at the university’s neglect of this landmark little lake. I replied—rather a lecture, I fear—on the wonders, the richness, and the biological variety of this singular body of water. It’s my favorite spot on the campus, a special place to visit at any time of the year, but especially on a late spring or summer morning-or snowy winter night. A walk across the bridge will reveal huge old carp, probably as old as I, lazing grandly around in loose formations of company. They, in their gray and hulking mystery, seem to me to have seen it all and will always be there giving their testimony. And there are goldfish of every hue and size, one ancient old devil of at least twelve pounds, easily spotted by the white edge to his orange tail. I think he must be the boss. 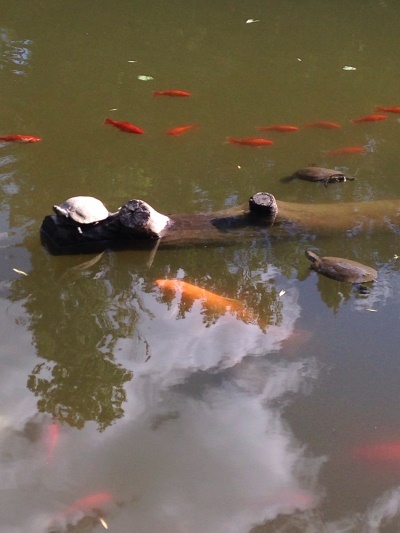 And of koi, no end, hoary old turtles, bass, bluegill and minnows. And myriad crawdads-that burrow in the banks, seen only when you take a stick, tie a string to it, attach a little hunk of meat, toss it out a few feet into the murky water, wait a minute or so to pull it out, and find a fine fat crayfish holding tight to what he thought was to be his dinner. But I never see kids doing that any more—the way we did…. Fishing in the lake is forbidden: I guess I know why, but, as a tried and true old poacher, I’ve been forever tempted to fish it anyway and challenge the authorities to throw a poor old man like me in jail—if they have the stomach for it. I could pull my degrees on them. The surround of the lake is wonderful too. Its shores at night witness many a delicious—or heart-breaking—tryst, all of it essential to that insatiable need. By the light of day, the lake is an unsurpassed place for a nap, loafing, study—or watching the fish, of which I never tire. The gracefully arched red sandstone bridge, as photogenic as the best of bridges, is just the place to pause, search the water below, and consider the immense Amplitude of Life it nourishes. Everything about this pond suggests that primordial stew from which all life, ours most certainly, has emerged. The entire site watched over by those grand old carp, some of them surely over fifteen pounds, and among the most intelligent of creatures that ever breathed water. Yes, you must see it at night in the amber glow of Macky, towering there to the east in all its majesty; while just across the street is hallowed Old Main where Professor Ralph Crossman once taught us of the Freedom of the Press, and, in the beginning, Mary Rippon taught Goethe and Schiller. Here is the soul of CU, old, original, and still intact. In those old days when a student wanted to get down into burgeoning Boulder, he had to have struck a bee-line out of Old Main, across the less cultivated Lake, past what was once the president’s home, and straight for the corner of what is now Broadway and University. Here is where the University most presented itself to the world. Before, that is, the emphasis shifted to the east and the monstrous presence of the new stadium—that Idol to Football—to which we are now summoned to support and give all. All the while, back in the serenity of our lake, and tucked away in the trees on the east shore, is the dream of an intimate Tuscan villa, Charles Klauder’s masterpiece, to my thinking, and home, now, to Germanic languages. You must walk gently around the lake and not miss the architectural detail of this exquisite building for which we have the Roosevelt New Deal of the 1930s to thank. This part of the campus-the lawns, the lake, Macky, Old Main, Hale Science—fervently romantic: replete with nostalgia, and the memory of traditional college life. I go there now in memory—of my undergraduate years as a returning WWII vet, and a lover even yesterday of those fish and the arches of the inimitable bridge shading them. I hope they live forever. Boulder, in 1910, pioneered a new idea: The Boulder Fish and Game Club. Founded by Swedish immigrant baker, Peter Johnson, the club early used Varsity Lake as a rearing pond for bass and catfish to stock in the farm ponds across the county. And, what’s more, I may be the last left alive to have known old Pete, this Boulder civic leader, who used to give me pieces of his imitations of Indian craftsmanship in which he took such pride—greatly to my grandfather’s annoyance. Water to Varsity Lake comes from the Anderson Ditch, which ditch was surveyed and dug by my wife’s great, great uncle, Jonas Anderson, buried only a few feet from his life-sustaining ditch in Columbia Cemetery. Great article about a storied little lake. I work a few minutes walking distance from this spot and I can attest to its quiet beauty. It presents a new face practically every day. Nobel Prize winners, Presidents and innumerable Notables have walked that bridge. It fairly hums with historic energy! It’s humble and simple but enduring and sweet. I have no criticisms of it. Thanks for doing a piece about it! In the 50’s and early 60’s we used to ice-skate Varsity Pond along with many other skaters. It was regularly scraped so the ice was smooth. They also used to flood the tennis courts down by the Ho Chi-Min trail for serious hockey. In any event those times have passed and when I walk past Varsity Pond on a cold weekend the ice looks unkempt and unsafe. But I feel comfortable in the knowledge I had my day on Varsity Pond.